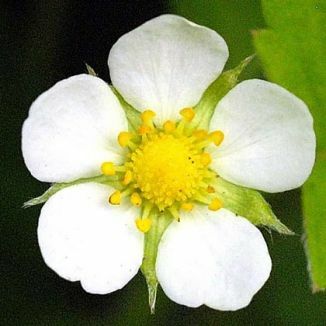 These pretty white five-petalled flowers which grow throughout the country are well-known to many of us as they precede the sweetest wild fruits of all, the tiny little strawberries. Along hedgerows, on banks and in full sunshine or shade they are a delight to find. The 15–20 mm flowers are borne on short, hairy stalks in loose clusters and bloom from April to July. The leaves are trefoil, bright green, toothed and have flattened silky hairs on their underside. The terminal tooth on the end leaflet of this plant is longer than the adjacent teeth, unlike in Barren Strawberry where it is shorter. The perennial plant sends out runners which root at the nodes, forming new plants. 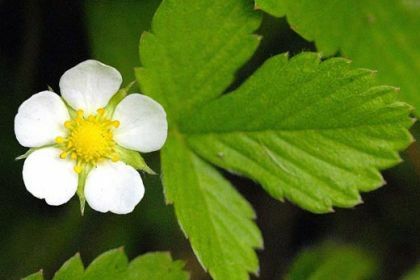 The petals of this flower slightly overlap which also helps to identify it from the Barren Strawberry, the petals of which are well separated. Wild Strawberry is a native plant belonging to the Rosaceaefamily. The fruits of this plant are really the tiny pips on the surface of the 'strawberry'. The 'strawberry' is in fact the swollen base of the flower. I can honestly say that there is nothing to beat eating one of these fruits straight off the plant.